Barn in Stithians, Nr. Falmouth, Cornwall, England - Granite Barn Conversion, Peaceful Rural Setting, 15 Mins Walk From Lake And 15 Mins Drive To Beach. The Dairy is a charming grade 2 listed barn conversion adjoining the farmhouse and was recently converted (by the current owners) from two barns, which were previously a milking parlour and piggery. It has a bright lounge/diner with a vaulted ceiling, cosy wood burner and French doors opening out onto the courtyard and garden; two double bedrooms, two bathrooms and a modern fully equipped kitchen. It is contemporary in style and has been decorated with local artwork. The Dairy has its own drive with parking for two cars and we welcome well behaved dogs. Set in a tranquil location, The Dairy overlooks the courtyard and garden with patio table and chairs and a barbecue. The garden is terraced over three lawned levels and great for garden games. It has a tree swing and a sunken trampoline. The Dairy was once part of the Tretheague Estate with it’s Grade II* listed Georgian Manor house built in 1744 by architect Thomas Edwards. All the old farm buildings are now restored and complete this lovely little hamlet: Tretheague Barton, The Farmhouse, The Cottage, The Dairy, The Piggery, The Granary and The Smithy. The Dairy lies on the edge of Stithians village and is perfectly situated for exploring both the North and South coasts of Cornwall. Truro, Helford Passage, Helston, Redruth and Camborne Mining Heritage, Newquay, St Ives, Padstow, the Lizard, Lands End, Penzance, Mousehole are all within touching distance. Jane And Gwyn would love to welcome you to the Dairy. We have been living in Cornwall since 2002 and absolutely love the life we have. We have two children Bethany and Benjamin 19 and 17 respectively. We moved to Stithians in 2007 and converted the barn initially as ancillary accommodation for relatives and now have recently updated it for holiday letting. We are happy to help in anyway we can to make your holiday as pleasant and enjoyable as possible. Bathroom 1: Roll-top bath, shower cubicle, toilet, sink and vanity unit Bathroom 2: Walk in shower enclosure, toilet, sink and vanity unit. Open-plan lounge/diner with vaulted beamed ceiling. French doors to the courtyard and garden. Three seater sofa and chair seated around a log burner, oak dining table and four chairs, TV with sky+ and DVD, nest of tables, sideboard, wifi/internet. Nearest dry ski slope is Plymouth: 67 miles. We surf in Cornwall. Falmouth golf club, Swanpool is 8 miles distance, with stunning views across Falmouth bay. Mullion Golf Club, Helston is 13 miles distance, and epitomises the best of playing golf in Cornwall. Killiow Golf Club, Truro is less than 9 miles away and is set in the magnificent grounds of Killiow Estate. Notes on accommodation: Jane and Gwyn live in the adjoining farmhouse with their children, Bethany and Benjamin and their dog, Jessie. If you require any assistance or extras, they are happy to help. Being dog owners themselves they appreciate a dog is a member of the family and therefore welcome at The Dairy. However, dogs are not allowed in the bedrooms and should be kept off the furniture at all times. They should also not be left unaccompanied in the barn at any time. There are six acres of fields adjoining the garden where you are free to exercise your dog. Outside: The large South facing garden is shared with the owners family. There are three tiers to the lawn, a tree swing and sunken trampoline in the garden. The courtyard, accessed from the French doors in the living room, has a patio table and chairs and a barbecue is provided . Cleaning / Towels / Linen / Maid service: Bathroom towels and bed linen included. Please bring your own beach towels. A Cot is provided, however, we ask that you bring your own Cot linen. Other: DVD player and selection of films, books, traditional family board games, blue tooth wireless speaker. Very comfortable cottage, a pleasure to be there for four nights. We were made to feel very welcome by Jane and Gwyn from the minute we arrived at the lovely Dairy cottage, which is everything and more we hoped it would be (the girls especially loved the garden with the sunken trampoline and tree swing). Our only regret is that we didn't book for longer than a week, we will definitely be returning for more stays in the Dairy. My husband and 10 year old daughter stayed here for 11 nights in July. We received a lovely warm welcome with delicious goodies waiting for us. The house itself was perfect - modern inside and set within a beautiful and charming farmyard. Our daughter had plenty to keep her amused after our days out - playing on the trampoline, table tennis and her favourite - the rope swing! The location was perfect for us - everything we wanted to see within an hours drive or less - Padstow, St Ives, Penzance, The Eden Project and of course numerous beaches. This is a true gem of a place. We had a brilliant stay at the dairy! Accommodation had everything you needed and was lovely and comfortable. A great base for exploring all the wonderful beaches nearby. Our 8 year old and 18 month toddler had a fantastic time. We will definitely return in the future. Jane and Gwynn made us very welcome, the Diary is beautiful and the attention to detail was second to none. The property is light airy and comfortable. We had a lovely few days, thank you!! Spotlessly clean, well equipped, spacious, comfortable. Ticks every box. Gyllyngvase Beach is only 8 miles from The Dairy and is one of the most popular beaches in Falmouth, a Blue Flag status beach, with its wide arc of golden sand and inviting sea. Great amenities, with award winning cafe, yet still only a 10 minute walk away from Falmouth town centre. Falmouth’s Swanpool Beach has superb watersports facilities on the sheltered south-west coast. 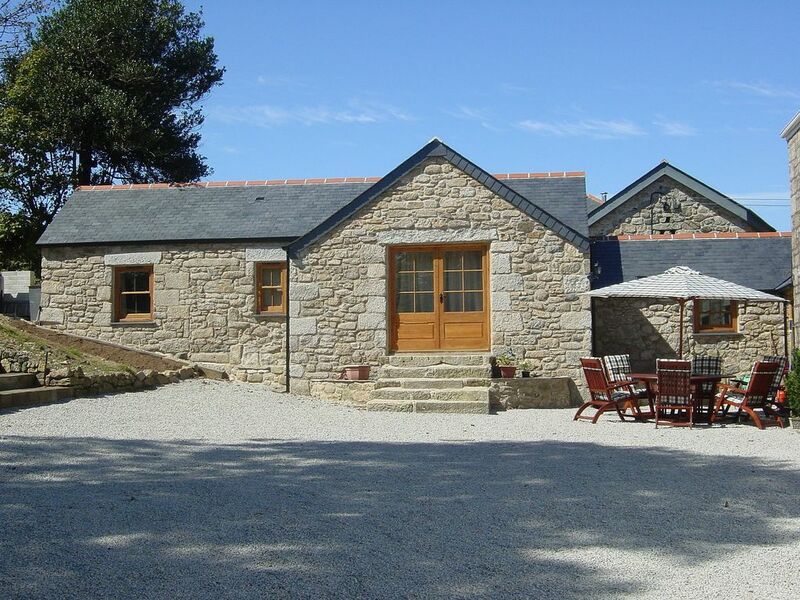 Gwithian towans, Perranporth (dog friendly), Praa sands, Portreath are all great beaches and less than 15 miles distance. A car is recommended to enjoy the best Cornwall has to offer. Nearest ferry: Plymouth 67 miles. Stithians village is half a mile away with a Church, a village shop and a Pub. Stithians lake offers sailing, windsurfing, Kayaking, canoeing, archery and climbing activities. Also walking, bird watching, fishing and cycle hire.Cornwall's cathedral city, Truro is 9 miles away. The most famous of Cornish holiday towns - St Ives - a maze of tiny cobbled streets to wander through is only 20 miles away. Supermarket's at Falmouth: Sainsbury's, Asda, Aldi and Lidl; Redruth has Tesco's. Falmouth, Truro, Helston, St Ives, Penzance offer a wide range of shops, cinemas, leisure, Theatre, bars and restaurants. Booking Notes: For more information or to book please e mail janecatherinewilliams@yahoo.com or phone supplying your name, address, telephone number, proposed date of arrival, how many weeks you wish to stay, whether you require super-king or twin beds in the master bedroom. Please advise if you require a cot. Dogs are welcome. Please advise if you are bringing a dog with you (at an additional cost of £25 per week). Changeover Day: Changeover days are Saturdays during peak season school holidays and for a minimum of a week booking. We can be flexible outside of peak season. Mini and weekend breaks are also available outside of peak season. Arrival time 3.00pm and departure time 10.00am Notes on prices: All prices include electricity, central heating, a basket of logs for the wood burner, linen and towels although visitors are requested to bring their own beach towels.